Numill Ltd has been serving rail industry companies for over 45 years. We provide an invaluable service to many of the leading rail groups by remanufacturing, modifying and manufacturing standard and specialist tooling. Cutting tools in this sector are usually doing heavy machining work which leads to a constant flow of damaged tools that need repairing quickly and cost affectively. The damaged tooling can come from anywhere globally and it is our aim to expertly remanufacture these tools to 100% working capability. Our customer list includes Progress Rail, Balfour Beatty, Cummins Engines, Wartsilla and Tata. We are also members of the Rail Alliance. We are fully aware of the time constraints our customers face and know that any tooling failure could result in considerable delays and cost implications due to the expense of the specialist tooling and the length of time it would take for a replacement to be made. For years now Numill have been helping railtrack companies avoid these lengthy delays and saved all of them money by remanufacturing their damaged tools. We have customers that machine the rail track form, owls and all varieties of frogs using complex and expensive special tooling that creates the rail form as shown below. The machining of these track sections inevitably leads to the tools getting damaged due to the high metal removal rate that can take place because of uneven castings. 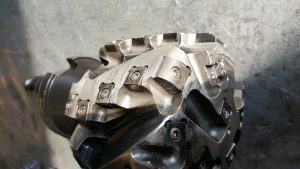 The uneven amount of stock material that needs machining off the cast track sections causes the cutter to work harder which in turn wears the tool out sooner than it should. The cutting parts of these tools are carbide inserts that are positioned to accurately cut the required rail form. The relationship between each row is vital. These inserts once worn shatter causing the damage to the cutter body. The cutter pictured below was spotted early and only had 1 pocket damage. As soon as even one insert has broken then the whole tool starts to underperform and leads to more inserts shattering. So the sooner any damage is spotted the better. On the first occasion that one of these cutters was presented to us for repair we were asked to provide any ideas and information on how to stop the cutters from becoming damaged in the future. The casting and machining procedures of these large sections of track and junctions couldn’t be changed. That meant the focus had to be on the durability, lifespan and cost of the cutters themselves. This led to the development of a process to remanufacture these tools at a fraction of the cost with a short delivery but without compromising quality or performance. We recommend to anyone using these expensive special cutters to be vigilant and look for the first signs of damage. Then send them to ourselves along with all the inserts and screws to refit the entire tool. Upon receiving the cutters preparation includes removal of used and broken inserts and screws. Viable items will be re-used. We then carry out the remanufacturing process by using a special weld deposit that is machined and heat treated back to the tools original hardness spec. 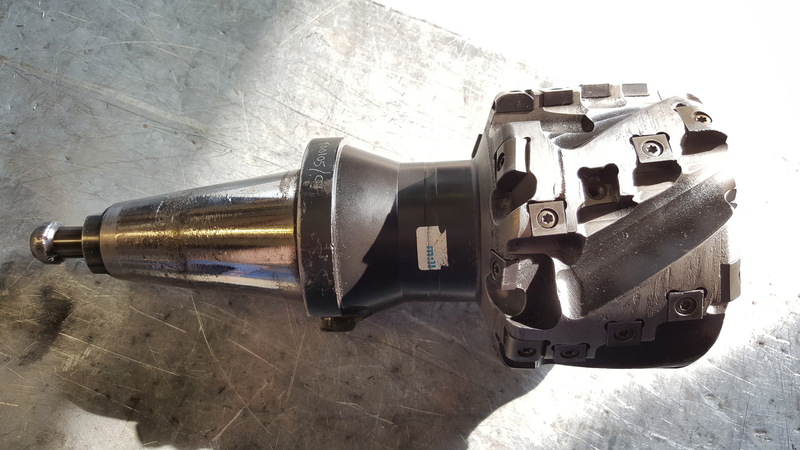 This is finalised by fitting the cutter with supplied inserts and screws and fully inspecting every insert position to guarantee that the customer can be confident the repaired tool will function at 100% capability. After initially conceptualising the remanufacturing process and developing the necessary work holding equipment we have been able to offer all of our customers an invaluable service which has continued for over 40 years. The cost saving benefits offered by remanufacturing together with mitigation of potential losses caused by production line stoppages are significant. The repairs alone can save between 70% for a minimal damage cutter to 30% on an excessive damage cutter. Remanufacturing saves money whilst providing the quality demanded. Our ‘value adding’ service is an integral part of our clients supply chain options.